Two former Hartlepool Mail staff have joined together to launch a weekly free newspaper reporting only positive news in the town. 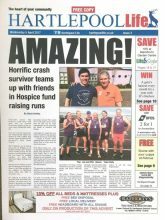 The third edition of Hartlepool Life, which has a print run of 25,000, comes out today. It is the brainchild of former Hartlepool Mail news editor Steve Hartley, picture editor Dirk Van Der Werff and newspaper sales manager Paul Healey, along with two local businessmen. The first edition was put together on a laptop in the back of a pub, although the five directors hope to move the paper into town centre offices shortly. The town’s main paper, the Johnston Press-owned Hartlepool Mail, is printed in Sunderland and most of its staff have worked out of the offices of the Sunderland Echo since 2012. Van Der Werff, who spent 25 years with the Mail, told Hold the Front Page: “Our print run is 25,000 and the reception by both advertisers and our readers has been overwhelming, thank goodness. “Our unique selling point is that we only carry good and positive news about the people of the town, and the businesses and schools in the town. Hartley, who serves as the paper’s editorial director, worked at the Mail for 18 years as news editor and assistant editor before being made redundant. The editorial duo are joined as directors by Paul Healey, former newspaper sales manager at Johnston Press North East, print and design business owner Ian Griffiths, and Hartlepool businessman Leo Gillen, whose family newsagent business used to sell 25pc of the town’s newspapers.